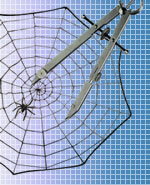 You'll find SpiderWriting will take a holistic approach to any web design project we're involved in. A good website should properly complement your business - not be a bolt-on supplement to it. We'll spend a high proportion of the initial stages looking at what business and marketing ideas you've used in the past - what's worked for you and what hasn't. We'll look at your customers and/or target market and match our design suggestions to these as closely as possible. We'll ensure that you understand the web design process and its business implications - what we propose and why - so there are no unknown areas and you are comfortable with all aspects. We'll then agree with you what is to be done, the cost and payment schedule, and how long it should take so that we're both clear what is included in the specification. Once we've agreed on a suitable web design we'll consult with you at all stages, giving you the chance to see the work in progress on test sites to help you to visualise the direction we're working in so we can incorporate any suggestions as we go along. We always try to make our designs as cross-browser compatible as possible and will advise if any ideas are likely to be unsuitable for a particular browser or platform. Similarly all our designs are search engine optimisation friendly from the outset. Accessibility is now an important consideration as well and we've always tried to design sites which are as friendly as possible to people with a wide variety of visual and learning difficulties. Once you're happy with the results we conduct final tests and make the site live. Should any problems become apparent with the site then we will normally fix them without charge. Further development beyond the agreed specification can then be discussed if desired, and ongoing maintenance can be provided at a suitable maintenance rate. The diverse nature of websites makes it difficult to quote prices before having a clear idea of the complexity and the amount of work that may be involved. For instance you may want a database-driven website with a full content management system, or you may be happy with a relatively simple "flat HTML" site. You may have lots of images that require optimising and resizing, or you may want us to produce a lot of original photography or artwork. All these sorts of factors will effect the price. Some designs may be suitable for a total project quotation while others will be more suitable for an hourly or daily rate. Please contact us to discuss your needs.